Here are some frequently asked questions WCAS receives via info@wcaudubon.org. Q: What is the Migratory Bird Treaty Act? A: The Migratory Bird Treaty Act (MBTA) of 1918 implements a treaty between the United States and Great Britain governing birds migrating between the U.S. and Canada. It is one of the oldest wildlife conservation statutes in the world and makes it unlawful to pursue, hunt, take, capture, kill or sell migratory birds covered by the Act. Expanded in range through similar conventions between the U.S. and Mexico in 1936, the U.S. and Japan in 1972, and the U.S. and the U.S.S.R. (1976), all were adopted as amendments to the original statute. The MBTA now protects over 800 species of birds within these migratory ranges. "Nothing is more priceless and more worthy of preservation than the rich array of animal life with which our country has been blessed." How Does the ESA Define "Species"? The term "species" under the ESA includes species, subspecies, and, for vertebrates only, "distinct population segments (DPSs)". Pacific salmon are listed as "evolutionarily significant units (ESUs)", which are essentially equivalent to DPSs for the purpose of the ESA. A: The Endangered Species Act of 1973 (ESA) was signed on December 28, 1973, and provides for the conservation of species that are endangered or threatened throughout all or a significant portion of their range, and the conservation of the ecosystems on which they depend. The ESA replaced the Endangered Species Conservation Act of 1969; it has been amended several times. A "species" is considered endangered if it is in danger of extinction throughout all or a significant portion of its range. A species is considered threatened if it is likely to become an endangered species within the foreseeable future. There are approximately 1,970 total species listed under the ESA. Of these species, approximately 1,370 are found in part or entirely in the U.S. and its waters; the remainder are foreign species. NOAA's (National Oceanic and Atomospheric Administration) National Marine Fisheries Service (NMFS) and the U.S. 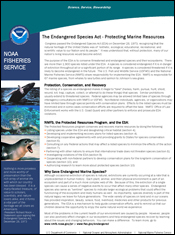 Fish and Wildlife Service (USFWS) share responsibility for implementing the ESA. Generally, USFWS manages land and freshwater species, while NMFS manages marine and "anadromous" species. NMFS has jurisdiction over 74 listed species. Q: Thought you might have some insights on this...my wife mentioned a few weeks ago that she thought she saw a cardinal stealing zucchini flowers off our plants. We put some rubber snakes down to keep birds away but of course we want birds around to eat the insects, so we took them out after a few days. But this morning while leaving the house I noticed a rustling in our raised garden beds. I looked closer and saw a male cardinal tucked under the zucchini. He snapped a zucchini flower off the plant and flew away with it. Is this normal (or not unusual) behavior? A quick web search didn't show that cardinals were partial to zucchini flowers. He's certainly going out of his way to get them. A. This is so interesting. I too looked for information on birds eating flowers (in general). Of course you get the tropical birds and parrots that consume flowers but our locals �. Hmmm. It is interesting that it is a cardinal taking the blossoms. I have had similar experiences with house finch literally eating my yellow crocus (not purple, not white �)and another time the yellow flower buds on a forsythia bush (I think that spring we had 10 whole flowers bloom on a large bush since the finches bit off the rest). Birds that have red, yellow or orange feathers derive some of that color from the foods they eat. Yellow flowers (like zucchini flowers, forsythia flowers and yellow crocus) have carotenoid pigments which, when consumed by the birds are soluble in fats and when the feathers are growing the carotenoid pigments are embedded in the growing feathers, hence the reds, yellows and oranges on feathers look spiffier. If your cardinals are consuming the flowers they may need whatever the flower has to get their plumage in good coloration. How do they �know� they may be lacking in this pigment �. ????? That�s another question that I cannot answer. I guess what you are hoping is that you will get some zucchini from your plants and not have all of the flowers taken. Zucchini have male and female flowers, hopefully the cardinal are not taking off all of the flowers and if they are � maybe they are taking the male flowers (won�t produce fruit) as opposed to the female (produces the fruit). Covering the plants with a light-weight netting like people put on fruit trees would keep the birds out, but pollinators can get in. A. Auk, vol. 91, April, 1974. Pp. 418-419�there is a short note about cardinals eating flowers. It was felt they were eating the nectar filled capsule at the base of the flower. There are also other reports of flower eating in cardinals. It might also be a good way to get spotted and stripped cucumber beetles, who live in the flowers. Q. Late last December I saw a great blue heron. Don't they fly south for the winter? A. A typical observation in spring. summer, or fall is of a great blue heron in slow water, silently stalking its prey of fish and frogs. Seeing a heron on the the edge of an icy creek in the middle of winter can make you look twice! While many herons do migrate out of Ohio for the winter, it is not unusual for some individuals to stay, as long as there is open water for them to hunt. More herons will be observed during warm winter, while typical winter weather with plentiful snow and ice will force these birds to move to where the conditions are milder. Q. I've heard that owls are completely silent when hunting prey. Can owls really fly without making any noise? A. Owls definitely have the equipment to make them an accoumplished predator, including modified feathers which reduce sound that would be caused by air passing over their wings. These apecialized feather are called fimbriate and consist of comb-like extensions alng the feather's edge. This adaptation greatly muffles sound, allowing the bird to ambush its prey in silence. main entrance on the lower level.